I love salty sweet things. One of my favorite sweets is dark chocolate, really don't waste my time with wimpy milk chocolates. One of my favorite salties is bacon, truly a food of the gods. I had my first taste of the two together is a Vosges Mo's Bacon Bar which I frustratingly enough haven't been able to find since moving to Minneapolis. So, I decided why not blend those two things together myself into a cupcake. I had run out of the Dutch Processed Cocoa I have been using & decided to try Hershey's Special Dark Cocoa which is a Dutch Processed blend. I was afraid it wouldn't have the flavor I was looking for but I was wrong. This cocoa gives a wonderful dark color & just the dark chocolate flavor I was looking for. Plus its about half the price & I can get it at Target. Don't skimp on the bacon in this recipe because these cupcakes are best when you get a nice chunk of bacon in each bite. I sprinkle each cupcake with a little Fleur de Sel before serving for just that extra touch of saltiness. Preheat oven to 350 F. Prepare 24 muffin tins. Chop bacon into about 1/2-inch pieces. Cook over med-high heat in a skillet until bacon is brown & crisp. 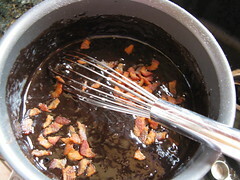 Remove bacon with a slotted spoon to a paper towel to drain. Pat any remaining oil off the bacon. Set aside. Melt butter in a large heavy saucepan over moderately low heat, then whisk in cocoa. Add water and whisk until smooth. Remove from heat. Whisk in separately sugar, eggs, buttermilk, and vanilla. Sift flour, baking soda, baking powder, and salt into the cocoa mixture and whisk until just combined (it will be a little bit lumpy). Stir in bacon. Fill muffin tins to about 2/3 full. Bake for 20 minutes until a skewer or toothpick comes out clean. It's a moist cake, so don't worry if a few crumbs stick to your tester. This is Hershey's Frosting recipe & still the best one I've tried. Frost the cupcakes & sprinkle with a little Fleur de Sel right before serving. Oh wow, I can't even imagine. 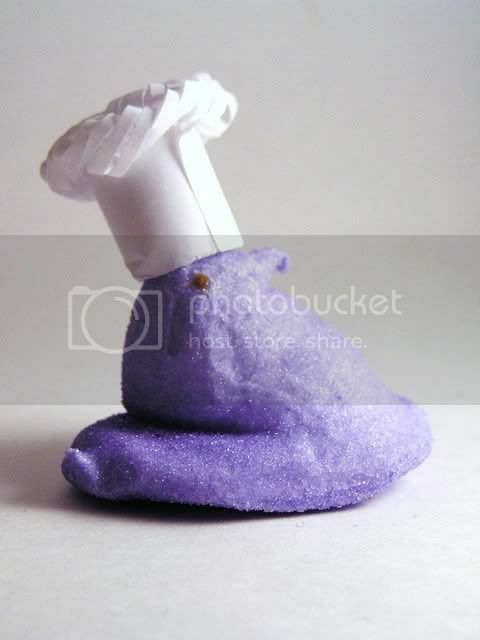 Do you have any photos of what the inside of the cupcake looked like? How Bacon-y was it? I don't have any pictures of the inside & because the bacon is fried pretty dark it doesn't really show up in the cupcake to look at. It is just slightly bacon-y, I mean you do get a bacon taste when you get a chunk of bacon but its more about the saltiness. Wow, those sound incredible. How did the frosting come out so dark? I would expect a deep brown, but all I see is black! Excellent work and very nice pictures. whoa...that's a very wild cake! I really wonder how that really tastes like??! what inspired you? Nick - The dark cocoa gave me that really nice dark color, I couldn't believe how black it was myself. Wow, I'm fascinated and weird at the same time. I love recipes that bend the rules a little:-) Definitely something I'll have to try for myself! Wow-- I think that's all I can say. The cupcakes sound great and your photo is amazing... I've read about the bacon-chocolate bar but haven't seen it in any stores out here either. That sounds amazing! Bacon makes everything better! Wow these sounds really unusual? The picture looks really good though, the frosting looks really good :) its so dark. i think they sell vosges at whole foods in mpls! Yes! Beautiful cupcakes, You can find Vosges Bars (particularly the Bacon ones) at Whole Foods, Kitchen Window in Calhoun Square, and Patina. And thats just in Uptown! Kind of glad you hadn't found them yet or else your ingenuity wouldn't have blessed the web with it's first(probably) Bacon Cupcake. Sounds great! I can't believe how dark the frosting is. I've never seen frosting that black. I can't believe you didn't use food coloring. I made cupcakes with bacon for the super bowl. They were a big hit. That dark chocolate is super dark! I like the sound if adding bacon to a chocolate cupcake. My gosh! 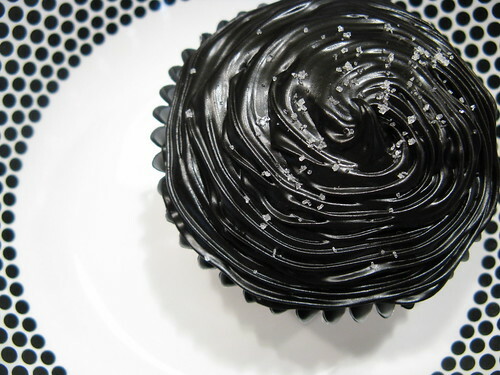 That picture is stunning, I'm still shocked at the black frosting. Sounds fantastic! My dad was just telling me how weird my mom & I are for liking the salty/sweet thing. He doesn't believe that there are other people out there that combine the two. I'm going to make these & not tell him about the ingredients, until after he eats one! Oh my gosh~ I can't believe you recreated that chocolate bar. It seems to be everywhere on the itnernetz these days. But I think you are the first recipe I've seen to recreate. Love me some cupcakes- very creative and very cool. 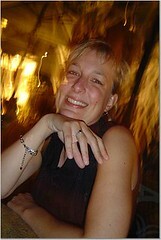 So Glad I saw you on the Leftover Queen forums! at the risk of sounding overly panglossian, this is truly the best of all possible cupcakes. chocolate and bacon. i could die happy. i've had other of vosges' bars (my favorite is the naga, milk choc with curry and coconut), but never the bacon. must rectify that. Thanks everyone for all the great comments. We finished the last cupcake last night & now I'm tempted to make more! Stef - Your super bowl cupcake looks really interesting! XQ & R Thomas - Thanks for the Whole Foods heads up, I need to go there today to get harissa so I'll see what I can find. 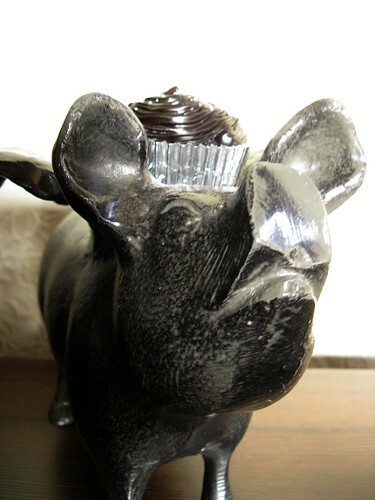 i was linked to your site by yumsugar and in awe at the idea and apparent success of your bacon dark chocolate cupcake. i will definitely test this on my guy friends and try to keep the secret ingredient a secret until they bite into it. this sounds like a course an iron chef would pump out of iron stadium. Great photo! I am looking forward to trying these out soon. Sparker - Its actually a little shallow bowl from Ikea. I made these yesterday for a hockey-watching party, and they disappeared rapidly. The icing alone is fantastic, and the salty bits of bacon balance the richness of the cupcake. The only problem I had was wanting to eat the bacon before it went into the batter. OMG!! I'm worshipping your bacon-ey innovation. Every time I think I've seen everything there is to see that is bacon, I come across more. These are def. on my to-do list. Thanks so much for sharing! The chocolates you mention (Vosges Mo's Bacon Bar) are made in Chicago. I am surprised you have not been able to find it, but then again it is a rare chocolate. There is a company in California that sells the product. You may be able to call them and find out what stores they sell the Chocolate bar too. The companies name is Cheeseworks and thier number is 510-769-1150. Good Luck in finding the chocolate bar near you. Micheal - Yes, "t" is teaspoon & "T" is tablespoon. Hope you like them! An absolute hit! So tasty - with the salt on top it's an absolute perfect mix. 1) I should make some for work and not tell people what's in them until they try it. 2) I should try a batch with cheese somehow. 3) I'm sure someone has done something similar to this, but I'm tempted to experiment with bacon, scrambled eggs and cheddar and baking them with either yellow cake or maybe even krustee's pancake mix and topping fresh with maple sugar and cinnamon for a truly breakfast version. What do you think? The Vosges bars can sometimes be found at the various metro Patina locations. I am a fan of Mo's Bacon Bar and I have just ordered them online. I got them in 2 days and if you're ordering a bunch of chocolate it works out pretty cheap. I just made a batch of these cupcakes. My fiance and I split one while it was still warm and gooey. They are excellent! So moist and tasty. I used edible silver leaf to decorate the tops - it really goes well with the foil wrappers. These look and sound awesome! I love how dark and rich the icing is. Almost as much as I love your little pig. Want him! Your frosting looks perfect! Did you pipe it on? What tip did you use? I was searching for something to make for my friend's birthday party this weekend and this fits him perfectly, thanks for the inspiration... well idea. ;) I can't wait to make these! Hey, I found your recipe on tastespotting and they turned out wonderfully. the frosting is really the best. I stuck a small piece of crisp bacon at the top (as a warning, maybe?). Anyway, thanks for the great recipe! I made these with applewood-smoked bacon. They were devoured. I encourage all doubters to try these. These are amazing - even without frosting. Great for breakfast too! YUM YUM... another good dark chocolate/bacon yummy is ice cream. My significant other is allergic to dairy... is there any way to modify this recipe and still maintain its integrity? Thanks so much for this recipe. I made these today for my husband and they're delicious! The frosting is divine! I think these will be a regular in my recipe box. I tried these at the weekend (who can see this recipe and not give it a go??) for friends and family, but unlike the other comments we all felt the bacon was completely unnecessary. The frosting was nice but too sweet for me (I'm in the UK so maybe we have it a bit less sugary? ), so I added some cream cheese (to keep with the bacon theme obviously:)) which took the edge off nicely for me. I'll definitely do them again, but minus the bacon. I might add a liquid salted caramel centre to compensate as that would add the sweet/salty hit you get from the bacon. I have a chocolate cake last year when I went to my province. I used the frost as the chocolate topping of the cake. I also like the style of your recipe.Bacon is indeed very useful in every recipe. made these cupacakes this morning..OMG they are good! Thank you so much much for posting!